Editors: Clutterbuck, David A., Kochan, Frances K. and Lunsford, Laura, et.al. 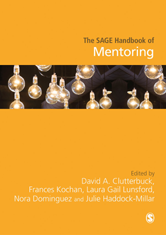 The SAGE Handbook of Mentoring provides a scholarly, comprehensive, and critical overview of mentoring theory, research, and practice across the world. Internationally renowned authors map out the key historical and contemporary research, before considering modern case study examples and future directions for the field.